In the Tarot, the Sephiroth are represented by the ten numbered cards of each suit (Figure 11) and by the Court Cards which are placed on the Sephiroth according to the principle of the mn> . 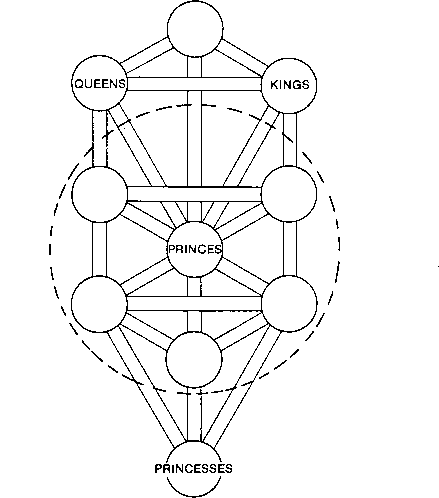 Any Ace pertains to Kether, any two to Chokmah, any three to Binah, etc. The Court cards, as we have indicated, are placed with the KingsOin Chokmah, the QueensCiOin Binah, the Knights(l)in Tiphareth and the Princesses(rOin Malkuth. 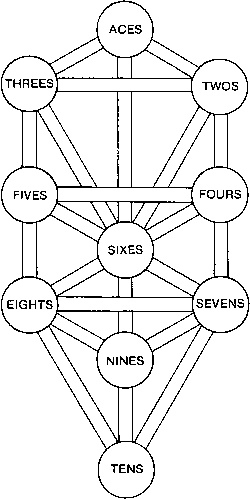 Actually, however, the Court Cards relate to the entire Tree, and not just selected Sephiroth (Figure 12). attributed to Chokmah, and the Heh, the watery feminine principle, is attributed to Binah. 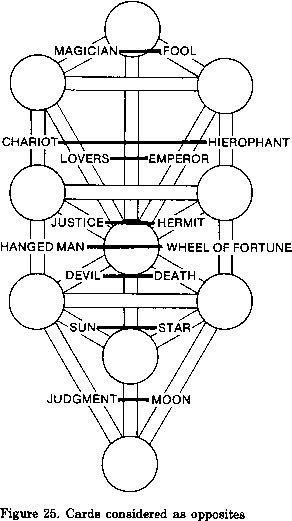 Vau is referred to Tiphareth, but it actually encompasses all of the Sephiroth under the Supernal Triangle, except Malkuth, i.e., those six Sephiroth to which Tiphareth is central, Geburah, Chesed, Netzach, Hod and Yesod. And when the hidden Sephira, Daath, is considered, a perfect circle is formed around Tiphareth. that definition is what the Qabalah is all about. It is a very clear and precise system, verbal smokescreens of the early Qabalists notwithstanding. Insofar as the numbered and Court Cards of the Sephiroth are called the Minor Arcana (Arcana means secret), they may appear to be of less importance than the Major Arcana or Trump cards. They are, however, of the greatest significance in that they symbolize the real potencies in ourselves and in the universe, with which we strive to come into conscious contact. 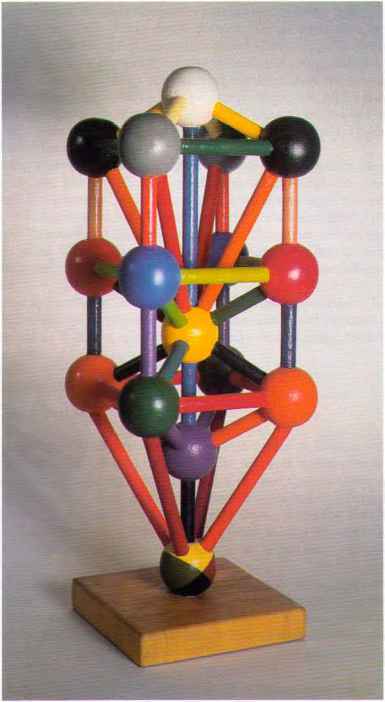 The Tree of Life in Three Dimensions ("In a Solid Sphere"). another. It may be the chariot which carries us down the road from one inner city to the next. Thus the Paths, while ultimately less important than the Sephiroth, are the primary focus of the Tarot deck. Second, as the cards are used for divination, they describe forces in transition which have brought about past events, function in the present, and have the potential to create future events. This might best be understood by considering the idea that we are all in a continual state of travelling the Paths. It is an unconscious process for most, but a conscious one for those pursuing the Mysteries. Moreover, we are unconsciously travelling many Paths at the same "moment." Our limiting concepts of time, space and form do not apply. As has been previously suggested, the choice of consciously travelling the Paths, one by one, has the effect of speeding up what would otherwise be a normal course of development. It also has the effect of speeding up the course of karmic action, so that one who becomes involved with the Tarot for the purpose of learning about himself and his universe, may suffer some serious personal problems at the onset. The reason for this is that a number of karmic debts are paid off at once and the "board cleared" of some major impediments to understanding. 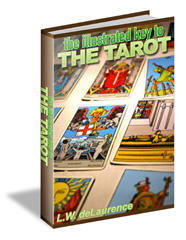 The Tarot is best used for divination about mundane matters. It is not particularly well-suited for furnishing answers of an important spiritual nature because it is rooted in Yetzirah, although one brings down insight from higher worlds in interpretation. What is the Tarot meaning for the 10 Sephiroth?